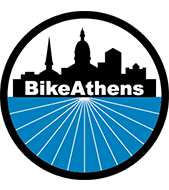 BikeAthens mission is to promote walking, cycling, and public transit as solutions to transportation needs through education, advocacy, and community service. We are committed to our vision of a comprehensive transportation network that all Athenians can use with confidence and ease. Development on the scale proposed by Selig Enterprises, Inc. for the Armstrong & Dobbs property will have a significant impact on access and mobility throughout the downtown area. The proposal continues to generate unprecedented interest in the future of downtown development. After reviewing early site plans, we issued a formal statement explaining our objections and concerns. Now, on the eve of the vote for the developer’s Special Use Permit—approval of which would create a binding site plan— it is important for us to update our statement and address the current debate surrounding the proposed development’s effects on alternate transportation. In initial plans, the Selig development did not include a road connecting Hickory Street to Oconee Street, in contravention of the ACC Transportation Corridor Concept Map (TCCM). At the time, we noted that without the connecting route, “a Mayor & Commission decision would be required to amend the [TCCM] at request of the developer.” The most current site plan includes a private Hickory Street connection between Broad Street and Oconee Street, albeit with 5ft bike lanes in a dangerous position behind diagonal front-in parking spaces. While would have preferred the Mayor & Commission explicitly amend the TCCM to clear up any confusion, we will focus on ways to improve bike and pedestrian safety by way of conditions on the Special Use Permit. The current plans for Hickory Street show 5ft bike lanes painted behind diagonal front-in parking (like that found on most downtown streets). The 2012 edition of the AASHTO Guide for the Development of Bicycle Facilities specifically recommends against such a design: “Bike lanes should normally not be placed adjacent to conventional front in parking.” (AASHTO stands for the American Association of State Highway Transportation Officials. It is specifically noted as the ACC Complete Streets Policy’s main reference book). We recommend a physically separated 10ft wide, two-way cycletrack (or sidepath) as suggested by Commissioner Girtz. Cycletracks are increasingly used across the country to create safer cycling conditions through physical separation of bikes and motor vehicle traffic. An exhaustive list of successful cycletracks would be too lengthy to include here, but many studies exist to demonstrate their ability to improve rider safety. Placed between the curb and parked cars, a cycle track would eliminate conflicts between bikes and cars backing out of parking spaces. Additionally, placing a two-way cycle-track on the plaza side of Hickory Street ensures that cyclists will not have to cross Hickory to access the Firefly Trail, making it easier for cyclists to transition between the trail and the surrounding streets. Our community has committed major funding and time towards the Greenway and other in-progress projects that will make the area adjoining the Armstrong & Dobbs property the most important non-motorized transportation hub in the county – connecting the Firefly Trail, Multimodal Center, and other facilities. BikeAthens firmly believes that any proposal should make the most of this important community asset. Last year, we raised objections to the way the initial site plans integrated with the Firefly Trail. The current plans for the development have addressed many of our concerns, but as many interested parties have noted, the current plaza design does not adequately link the development to the trail. This link is only more convenient for cyclists and pedestrians—it will also increase walkability and bikeability, which will have profound economic, health, and safety benefits for the community. We agree with Commissioners and fellow advocates calling for a direct, graded path between the development and the Firefly Trail. We also agree that the aesthetics of the development facing the trail are important and must be taken into account. The increased congestion caused by the creation of such a dense development on the edge of downtown exacerbates the incompleteness of the Oconee Street Corridor. Oconee Street is already over its auto traffic capacity and is unfriendly and unsafe for walkers and bikers. Therefore, it is increasingly important that Oconee, Wilkerson, and Broad Streets receive Complete Streets design treatments to make them safer for all road users. Additionally, the measurable and drastic economic benefits of increased walkability and bikeability can no longer be denied. Neither the Greenway nor the commercial spaces planned for the development will reach their potential if they are inaccessible to cyclists and pedestrians. 1) We support a physically separated 10ft wide, two-way cycletrack (or sidepath) as suggested by Commissioner Girtz. 2) We agree with Commissioners and fellow advocates calling for a direct, graded path between the development and the Firefly Trail. 3) We also agree that the aesthetics of the development facing the trail are important and must be taken into account. 4) We stress that Oconee, Wilkerson, and Broad Streets need to receive Complete Streets design treatments to make them safer for all road users. 5) The noted economic benefits of increased walkability and bikeability cannot be denied. Neither the Greenway nor the planned commercial spaces will reach their potential if they are inaccessible to cyclists and pedestrians.